He’s a tails-up Greyhound. That’s why we decided to adopt him sight unseen six-and-a-half years ago. At the sound of the words “go out” he pops out of bed and dashes to the door. Even though he can’t see it he knows where it is. His once beautiful brown eyes now look like white marbles and although we no longer make eye contact we have more physical contact since he became blind. Fortunately Boomer has made the transition from sight hound to blind hound with minor modifications and remains an active happy Greyhound. I first became concerned that he had visual problems after noticing he didn’t fly down the outside steps at night; he was slower. During the day Boomer would still run around the yard, so I assumed it wasn’t a motor problem. Then he began slipping inside going down our hardwood stairs. The whites of his eyes became red and he would rub them. In the dark his eyes would glow green when the light reflected in them. From my reading I became suspicious that he had progressive retinal atrophy. Difficulty with night vision and going down stairs are the first signs. My veterinarian diagnosed cataracts but said veterinary ophthalmology was a specialized field and referred me to a specialist that comes to Maine to consult. Another general practice vet who saw the dog said she couldn’t diagnose his eye problems. As I waited anxiously, I wished there were more veterinary ophthalmologists in New England. “Blindness is never a reason to euthanize a dog” the veterinary ophthalmologist said when Boomer was diagnosed with three eye diseases at age seven. It saddened me that he felt he had to say that. I had read that blind dogs could learn to compensate with their other senses. 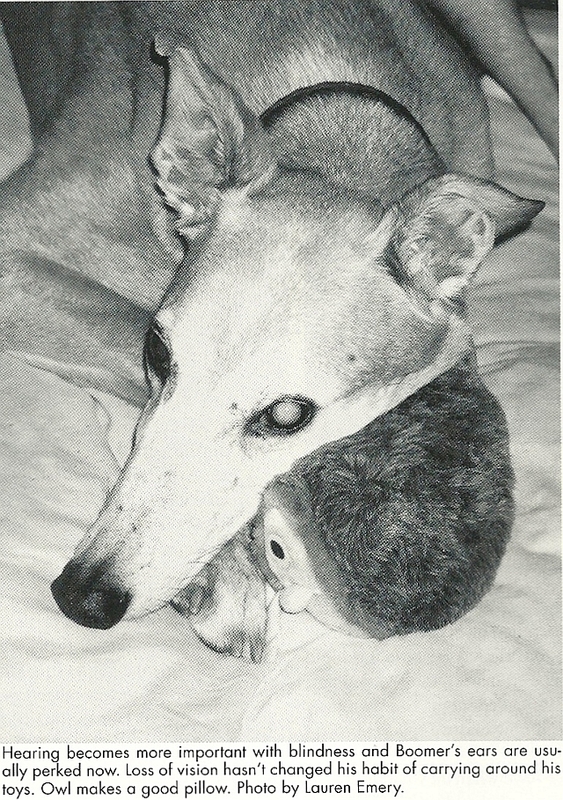 Our Greyhound was diagnosed with progressive retinal atrophy (PRA is a genetic disorder), pannus (an autoimmune disorder), and immature cataracts. He was put on dexamethasone ointment for pannus but would become completely blind from PRA. I was somewhat prepared intellectually for this but not emotionally. 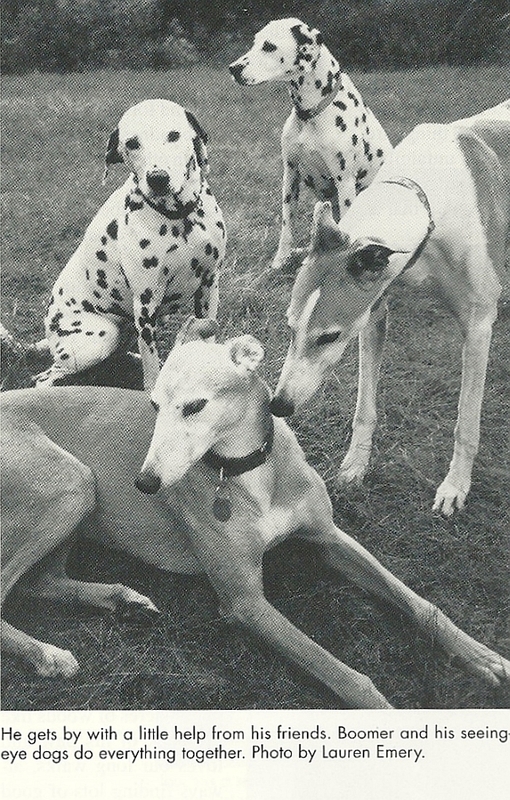 How common is blindness in the Greyhound population? A health study completed three years ago of Greyhounds adopted in Colorado showed that five percent of the 626 responses reported cloudy eyes and impaired vision. Another blind Greyhound lives in our small town and a dog just off the track that has cataracts is in our adoption kennel now. I wonder if we will see a rising incidence in vision problems as more retired racing Greyhounds are placed in homes and live longer. 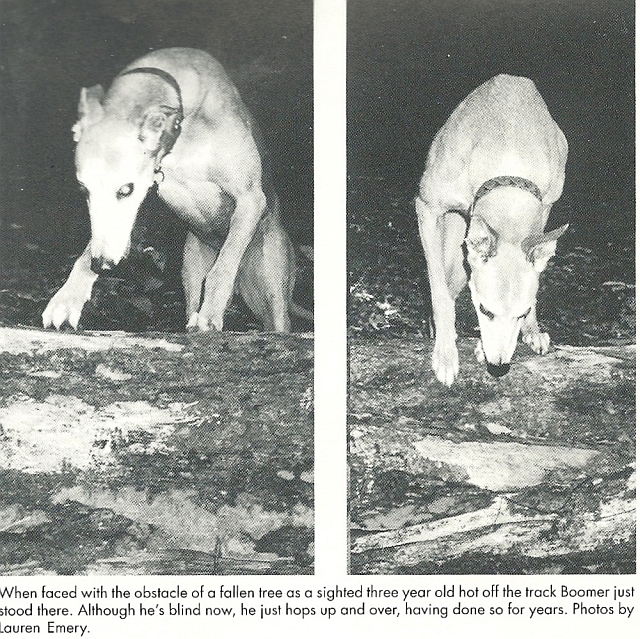 When I came home from our consult with the veterinarian I pulled out an article I had saved from an old Greyhounds Today magazine about a blind dog with pannus. I tracked down the author that night that was very upbeat when I spoke with her. What was not available at the time is a book called Living with Blind Dogs — A Resource Book and Training Guide for the Owners of Blind & Low Vision Dogs by Caroline D. Levin, RN, self-published in 1998. A dog trainer and registered nurse who worked a decade in the field of human ophthalmology, she became a manager in a veterinary ophthalmology practice and saw how dogs and their owners needed help in adjusting to blindness. The owners needed help dealing with their sorrow and grief to accept their dogs’ blindness and the dogs needed understanding, environmental modifications and skills training. Blindness can strike a dog at any age and may be gradual or sudden in onset. The dog’s general health, personality, and his position in the pack are other factors that affect how it will react. Sudden onset blindness creates more of a traumatic initial adjustment problem. Levin states that dogs may have a “fight or flight” response and become more aggressive or depressed. It may increase separation anxiety and create an increase in dependency in some dogs. Levin stresses not to encourage dependency so that the dog can regain its confidence and mobility. Her book offers many step by step positive reinforcement training outlines, some of which capitalize on the superior canine senses of smell and hearing. Formal training may help a blind dog adapt more quickly and work through fear and dependency issues. With gradual onset blindness the dog can slowly adapt by developing a cognitive map of its environment and by relying on scents, sounds and temperature changes. The owner may not notice the loss of vision until things are out of place or the dog is in unfamiliar surroundings. Boomer has adapted so well to his gradual loss of sight that at our last checkup with the veterinary ophthalmologist I said I thought the dog had some very slight vision remaining. He patted me on the shoulder, smiled, and told me my dog had no functional eyesight. In some situations blindness may be associated with significant pain causing dogs to be stressed and inactive. With the surgical removal of the eyes and resolution of pain our ophthalmologist has seen a number of blind dogs that rapidly returned to their normal dispositions and habits. In her book, Caroline Levin deals with the complexities of pack behavior and states that few dogs are truly alpha. Many are sub-alpha and trade the leadership role back and forth. They tend to adapt easier to blindness, often doing best in homes with other dogs. I believe Boomer is more active, confident and less isolated because of the stimulation of his three other dog pack members. How has our Greyhound’s life changed since becoming blind? I stopped taking him to adoption demos as soon as his eyes began to look a little cloudy. Instead of running a lap or two full tilt around the house, Boomer jogs near me in the yard and field. He rarely passes on an opportunity to go outside with our other dogs and doesn’t need help getting around in our huge fenced yard. Boomer knows the rough trails on our 50 acres of woods like the back of his paw and loves our long walks, always finding lots of good things to sniff. Sometimes I steer him by his collar when going down stairs or when in an unfamiliar place, but putting carpet treads on our indoor stairs solved his problem with slipping. He continues to be very busy at home transporting fuzzy toys and little blankets to all the dog beds. Watching him maneuver in the house you wouldn’t know he was blind but when I switched the water bowls on the floor to raised bowls it took him a while to really catch on. When I moved the wire dog crate that I alternate the male dogs in it took him a long time to learn the new set up. At this point he doesn’t jump up on the bed anymore and rarely gets up on the couch. We have avoided boarding him as I know it would be extremely stressful, even to put him in a friend’s house, and I would never put him in a boarding kennel now. As he has relied on his sense of hearing more, his ears are usually perked. He has become our blind watchdog and barks more. He is still part of the evening pot-licking clean up crew and loves spaghetti night. Since he can’t see us Boomer nuzzles us more now and we touch him and talk to him more often. The typical reaction people have when they see this beautiful dark red Greyhound is to say “Is he blind?” or “What’s wrong with his eyes?” I am touched by the few people who just approach him like any other dog, crouch down to pet and speak to him, and don’t focus on what’s “wrong” with him. There is so much that’s right with him. The world is full of sensory stimulation for a blind sight-hound whose other faculties are intact. His abilities to scent and hear far exceed ours, but most importantly he feels secure and confident in his environment and knows we are there for him. Below is a brief summary of some of the recommendations from Caroline Levin’s book Living with Blind Dogs: A Resource Book and Training Guide for the Owners of Blind & Low Vision Dogs. • For low vision dogs strips of contrasting tape placed on stair edges, door jams and wall corners may be beneficial. Use night lights and good outdoor lighting especially for dogs with impaired night vision. • Try to maintain your current furniture arrangement and don’t leave objects where the dog could bump into them or trip on them. • Oil based scents applied very sparingly can help the dog learn to avoid bumping into certain furnishings or can help identify doors, stairways, and the like. Before moving to a new home ease the transition by using different oil scents to mark the door, food dish, and dog bed in your current home and carry this over to the new residence. • In a new setting supervise the dog while he explores one room at a time until he is familiar with the layout. • Pipe insulation can be used as a bumper on table edges and wall corners. • When out walking, help steer a short blind dog by threading the leash through a piece of PVC piping to make the leash rigid. With very tall dogs you can use a leather collar with a handle. They are commercially available. • Teach verbal commands for slow, stop, come, and directional cues. • Stair training, especially descending, is one of the hardest skills to teach. Work on one or two stairs initially, going up, using food treats on the stairs. For descending one technique is to place treats on tape by stair edges and guide the dog to smell the tape and treat. • Small bells on your other dogs collars and pinned to your clothing can help the blind dog know where everyone is outside. • For play use the Buster Cube, do a tracking game with a biscuit on a string, and make a food trail to a favorite toy. • Hire a dog sitter instead of boarding a blind dog to minimize stress.